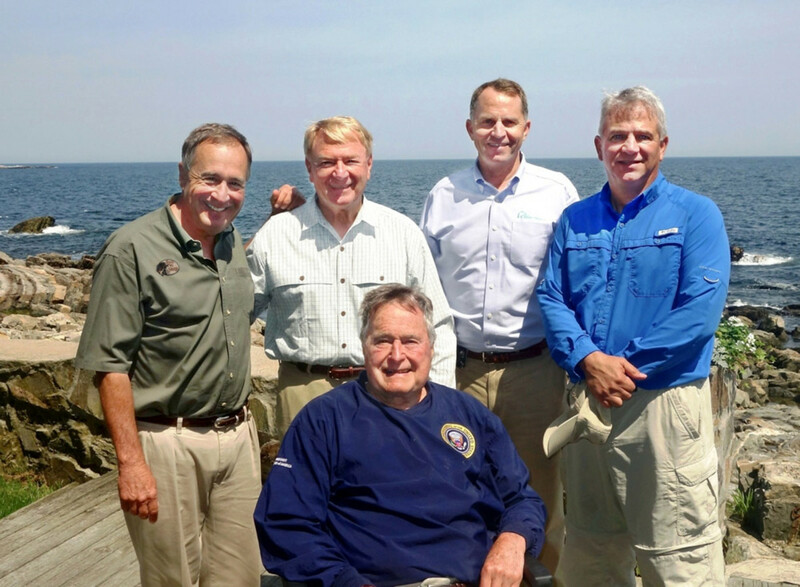 Conservation leaders gathered last Tuesday to go fishing with former President George H. W. Bush (front). They are (from left) Johnny Morris, founder and CEO of Bass Pro Shops; Matt Connolly, president of the Bonefish and Tarpon Trust; George Dunklin Jr., president of Ducks Unlimited; and Mike Nussman, president and CEO of the American Sportfishing Association. Helping former President George H.W. Bush continue to celebrate his 90th birthday, a group of conservation leaders, headed by Bass Pro Shops founder and CEO Johnny Morris, gathered to go fishing with Bush and to honor him for his commitment to conservation. Several groups honored the former president. “All of us at Bass Pro Shops are proud to stand beside key conservation partners today to pay tribute to President Bush for everything he has done to uphold our hunting and fishing traditions, as well as for his work to restore and enhance wildlife and fisheries habitat,” Morris said in a statement. Bush has had an “immeasurably profound, positive impact” on the nation’s fish and wildlife resources, Morris said. “He is a passionate fisherman and sportsman whose well-known love of fishing has made him one of the best ambassadors the sport of fishing has ever had,” he said. Morris has seen Bush’s love of the great outdoors and his long-term commitment to the environment during many fishing trips with the president, including remote tent camp outings to Newfoundland and Labrador, Canada; trips to the Arctic’s Tree River; the fabled River Test; bass fishing in Alabama; trout fishing in the Ozarks; and striper fishing in Maine. National Fish and Wildlife Foundation executive director and CEO Jeff Trandahl used the June 17 event to announce a partnership to provide a $1 million gift to the new President George H. W. Bush Conservation Fund. The fund will support conservation projects that are important nationally and can produce significant benefits for fish, wildlife and their habitats. The fund’s first effort, supported by Bass Pro Shops and the foundation, will go to support the Penobscot River Fish Recovery and Habitat Restoration project. The $2 million initiative will benefit important Atlantic Coast fish species, including Atlantic salmon, river herring and American shad. Another honor bestowed on Bush at the celebration was the KeepAmericaFishing Lifetime Achievement Award in recognition of his leadership and lifelong personal commitment to recreational fishing and the conservation of fisheries and wetlands. This is the sportfishing industry’s inaugural award and it is named for the former president. The award was presented by American Sportfishing Association president and CEO Mike Nussman. At the gathering to celebrate Bush, the Recreational Boating and Fishing Foundation announced another $125,000 gift from Morris in Bush’s honor. The donation will be used to support the RBFF’s new Hispanic outreach campaign.